On August 1st, 2014, we revealed all of our 2014 180 Medical College Scholarship Recipients. And as our winners begin their classes this fall semester, we will continue highlight individual winners on our blog. Last week, we featured Nichole Sheridan. 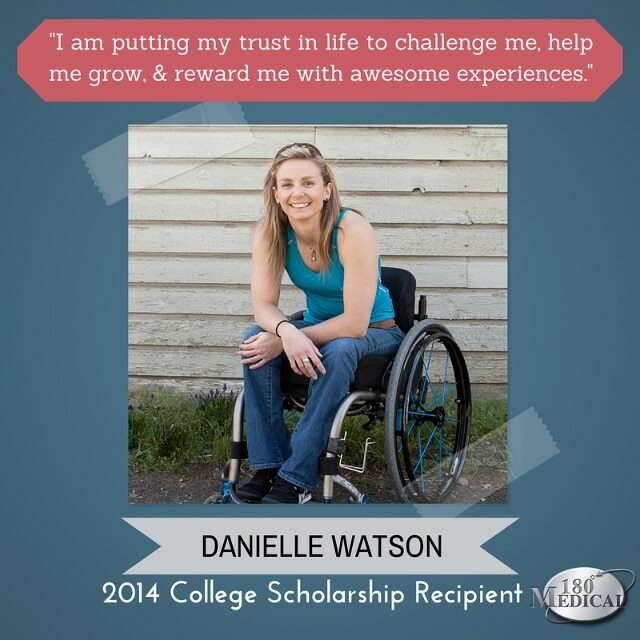 This week, we are happy to turn the spotlight to another well-deserving recipient, Danielle Watson. Danielle has always loved being active, and not even the accident that changed her life could change her drive to succeed. In the summer of 2011, she fell 300 feet in a rock-climbing accident, breaking her back at and leaving her paralyzed at T6. Despite the long rehabilitation process in the hospital and multiple surgeries that followed this grueling ordeal, when her surgeon told her that she had “survived the unsurvivable,” she decided to honor every moment. The realization that she was still alive helped her to keep her outlook positive, even through the hard process of adapting to life in a wheelchair. Since that time, she has gone back to school, maintaining a 4.0 GPA and an Honors student standing. She currently volunteers at Volunteers in Medicine and Oregon Adaptive Sports, and she also travels for inspirational speaking engagements. 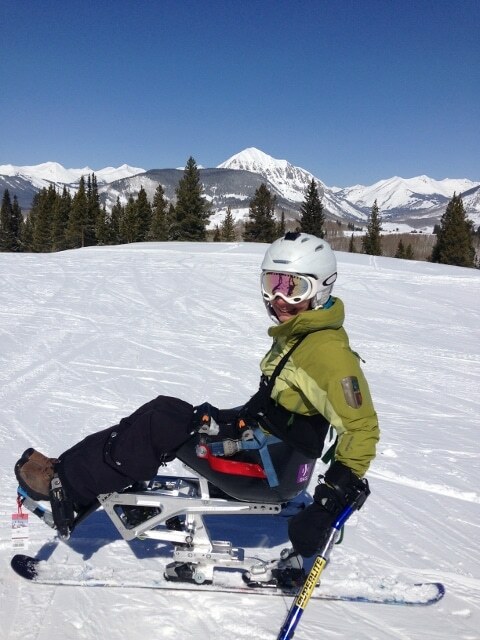 She stays active with many hobbies, including mono-skiing with Oregon Adaptive Sports, mountain biking and ski camps at Adaptive Sports Center, art, and she has also completed 3 half-marathons, one marathon, and a triathlon. Danielle is attending the University of Puget Sound this fall to pursue a career in Occupational Therapy and is really excited to have an opportunity to help others in her future job. She really demonstrates an unbreakable spirit and a drive to keep staying active, no matter the circumstance, and we’re glad to play a part in helping her to achieve her dreams. Our scholarship program was created to help those with spinal cord injuries, spina bifida, transverse myelitis, and/or a neurogenic bladder. Paying for college isn’t easy these days, and we understand that there are often extra financial difficulties for aspiring students who live with these conditions. To learn more about 180 Medical’s College Scholarship program, visit https://www.180medical.com/Scholarships. The nine 180 Medical College Scholarship recipients have been announced. Come meet one of the winners, Garrett, and learn a little more about his story and the goals he plans to achieve through college.